Paddle boarding is a type of water sport where the participants propel the boards with the help of paddles by either kneeling down or standing up on the paddleboards. 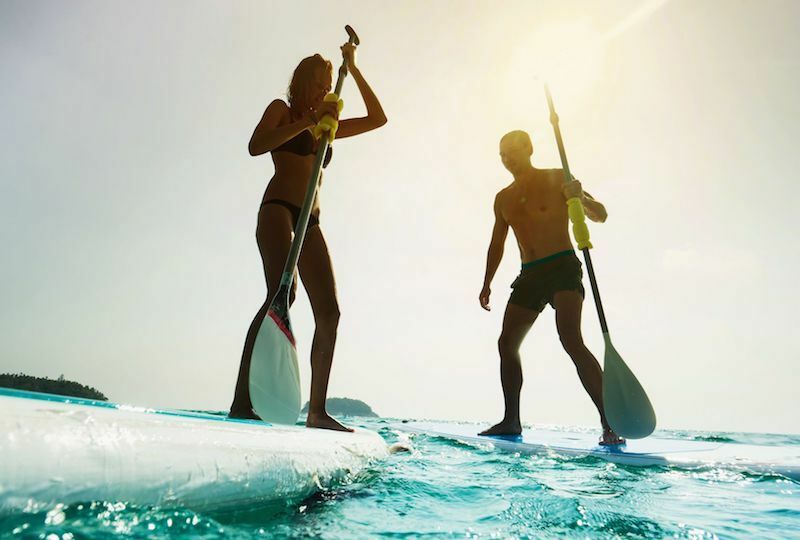 When it comes to paddle boarding, people use it for different purposes including for fitness, as a sport, sightseeing, outdoor recreation or eve to race on lakes and even for fishing. Most of the Best all around paddle board are made using various materials including fiberglass, carbon fiber and epoxy. Who Makes the Best Paddleboards? It helps in reducing stress to a great extent. Water is a natural relaxing agent that soothes your body and when combined with exercise, it is a great stress reliever. And add the lullaby of a sound as you glide slowly through the water along with the natural rhythm as you paddle and the feeling of gliding along naturally starts to relive all the stress you’ve acquired over the past couple of days. A day out on your paddleboard tends to cause a kind of soreness on your body, but never mind that it means that you are actually making your body stronger and tougher and also increasing the overall body strength. If you are looking for a body board instead, check out this article. Paddle boarding is also a great cardio workout as it gets the heart rate up while paddling and challenging your friends for a race. Once you master the art of standup paddle boarding, you can see that your balance on the board is naturally improving and improves your overall endurance levels. It is also great exercise when you are coming out of an injury. Paddle boarding is not a tough exercise as it is kind of produces a low impact and help you to slowly regain your strength and make your muscles and joints stronger in a course of time. To find out more, please check out this article. This is the ideal paddleboard for beginners who are just trying to learn the sport of paddle boarding. If you are not sure which type of paddle board will suit yourself, then you can always go for the all-around paddle board. These type of paddle boards specifically built to handle all kinds of conditions are generally strongly built and provides for a stable paddle boarding experience. It can be used for all kinds of paddling including surfing, racing and even for fishing. If you are looking to paddle in flatwater, then as the name suggests the flatwater paddle boards are your best bet. It can be used to flatwater paddle and cover even long distances. These boards are generally longer than an all-round paddle board. If you are looking to go on a boarding trip in flatwater, then this would be your ideal option. Since they are longer than all-round paddle boards, you can keep some additional gear on them. They are also quicker in the water than all-round paddle boards. These long and narrow paddle boards are perfect for racing and long distance paddle boarding. These paddle boards are quicker than flat water boards as they are narrow and cuts through the water easily. But these are not as stable as other kinds of paddle boards and hence require a professional or trained paddler to handle them efficiently. These boards are definitely not recommended for beginners as it is difficult to control and balance yourself on these paddle boards unless you are experienced in it. However, if you are an experienced paddle boarder, then visit our article on the best touring sup. Ideal for going on a fishing trip as these are stable and could accommodate a lot of gears than other paddle boards. There are also some fishing boards that come equipped with rod holders along with built-in storage space to secure your belongings. If you are looking for some additional stability, you can go for boards that come with side extenders. But these boards are the slowest when compared to other type of paddle boards. These are also perfectly suitable for beginners are they move slowly and are much more stable than the others. If you are looking to paddle your way along the waves, then the surf paddle board is your best bet. These are generally egg shaped while other types of paddles boards come narrow in shape. These boards are slow but are easy to maneuver along as you need control in the waves. Get the best stand up paddle boarding tips here. Not your everyday paddle boards as these boards are designed for people to do yoga in the midst of water. While there are not many boards available in the market, you can even use an all-round or surf paddle boards for this purpose. But make sure you to equip your board with kind of traction grip to lend more grip on the board. In case you are thinking about why you should try stand up paddle board yoga, then please click here. As the name suggests, these inflatable boards are designed for people who don’t have much space to carry along their long and narrow paddle boards with them. These can be easily inflated/ deflated within minutes and also easy to carry along wherever you go. We have written a detailed article on the Best inflatable stand up paddle board. You can find all the required information and reviews there. The important factor that needs to be considered is for what purpose you are buying a paddle board as paddle boards comes in various shapes and sizes based on different requirements. Say if you are looking for a surfing paddle board, then you definitely need to buy a surf paddle board as that comes in a unique egg shaped size perfect for surfing. Likewise if you are going fishing, better go with the fishing paddle board. Next is to understand the size of paddle board in terms of volume. So if the board is wider and longer than that board could provide more volume and it means it could be much more stable in the water. So if you are beginner, then you can go for boards of these sizes. You also need to consider your height and weight while choosing the paddle board. If you are a woman looking for paddleboards, you can find our reviews on the Best paddle boards for women. Paddleboards are available in many of your local surfing stores and you can even order from many online websites. But if you are looking for the Best all around paddle board along with other accessories, then you can check out some of the places provided below that offers top notch paddle boards at reasonable prices.